MET League of Colleges was established in 1989. They are a part of the Mumbai Educational Trust (MET). The vision of MET is to redefine the system of education. The various institutes under MET conduct courses that are university accredited and autonomous. 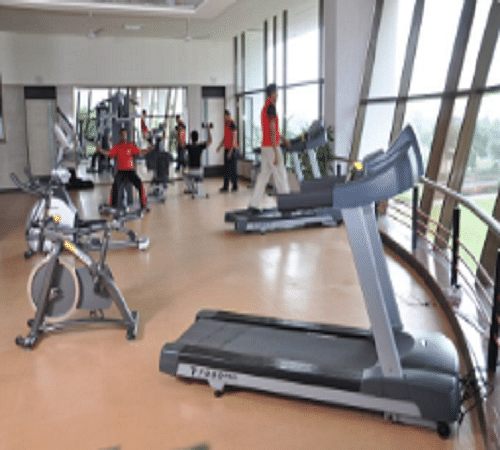 The institutes are ISO certified and affiliated to the University of Mumbai. 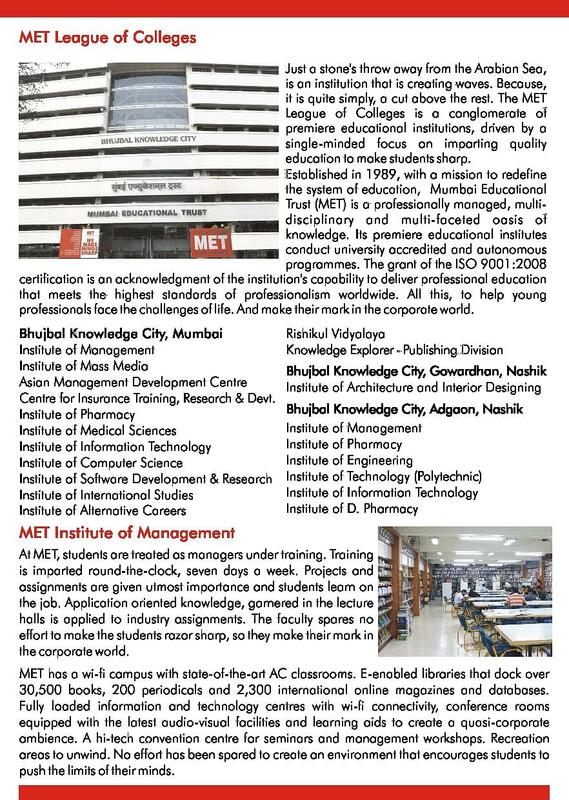 MET Institute of Management, Mumbai is a private institute and has been approved by AICTE. The institute offers a plethora of postgraduate management programs and it also offers a Ph.D. program. 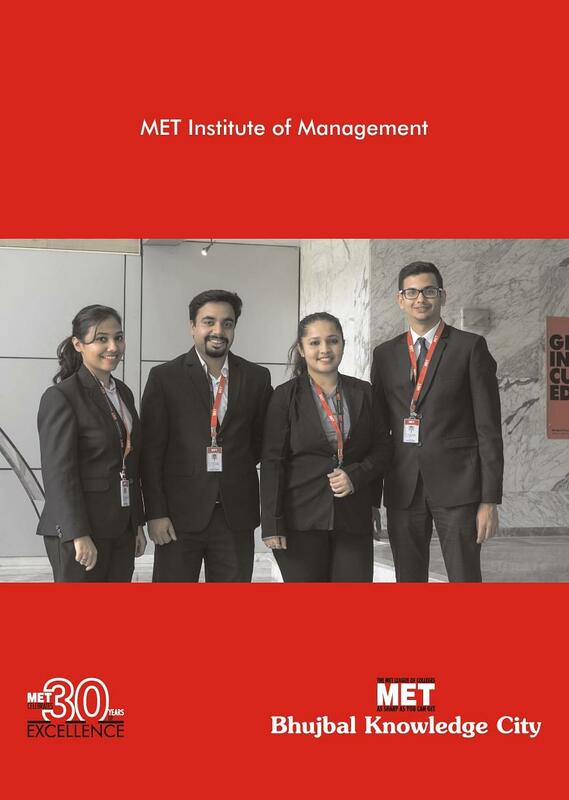 MET Institute of Management Admissions are based on the marks secured by the candidates in graduation and for Ph.D. program admissions eligible candidates have to appear and clear PET examination conducted by the university. MET students are known to be assertive, knowledgeable and global in their outlook and consistently add value to their corporations and have moved up the ranks faster. The institute has a reputation for delivering professional education which meets the highest standards of professionalism worldwide. MET has been given the status of an NGO in Special Consultative Status with the UN (ECOSOC). PGDM (e-Business) won the “Indian B School Specialization Award”. 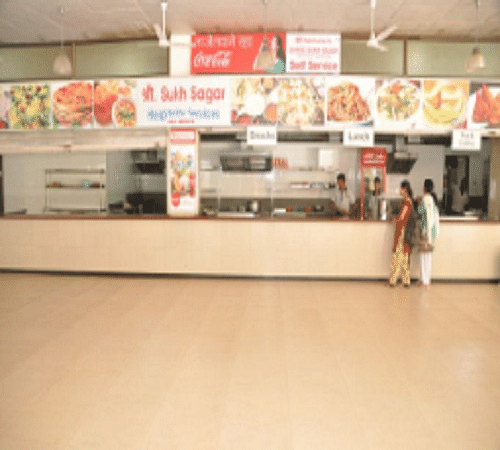 MET is an approved training partner of the National Skill Development Corporation. The institute has the best e-enabled state of the art infrastructure. It has a strong alumni base of over 15,000 students. Excellent placement opportunities in India and overseas. The institute focuses on the delivery of lifelong learning skills to build critical professional competencies. MET is a Ph.D. Research Centre of University of Mumbai and Savitribai Phule Pune University in Computer and Mechanical Engineering and Management. The institute sensitizes the students towards social causes through CSR programmes such as - Save Water, Project TRUTH, Vidya Shakti, MET Seva, Swaccha Bharat Abhiyan, etc. It provides global internship opportunities in countries such as the UK, China, USA, and Dubai. MET registered its victory and emerged as a Champion at HOWZZAT T-20 Cricket Tournament 2019. Ms. Priyanka Shewale, a student of MMS from MET Institute of Management was selected to represent India in the 10- Day ‘Taiwan Rotaract Round Trip 2018’. MET management student Akash Dandekar was awarded the E4 Best Summer Project 2016 second runner up trophy. The AICTE–CII survey of Industry-Linked Technical Institutes 2015 declared MET Institute of Management as the PLATINUM category Institution. Ranked 5th among ‘Best Communication Management Institute’ in India by The Edutainment Show in 2016. 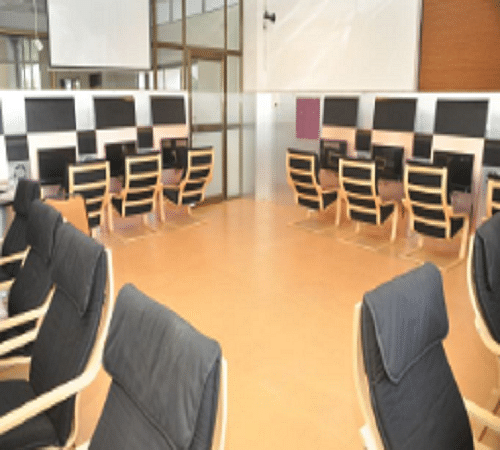 MMS (Masters in Management Studies) It is a two-year full-time course in management. Eligibility- The candidate should have a Bachelor’s degree with minimum 50% of marks in the aggregate from a recognized university. The candidate needs to have a valid score in MAT/ CMAT/ MAHCET. Eligibility- The candidate should have a Bachelor’s degree with minimum 50% of marks in the aggregate from a recognized university. Ph. 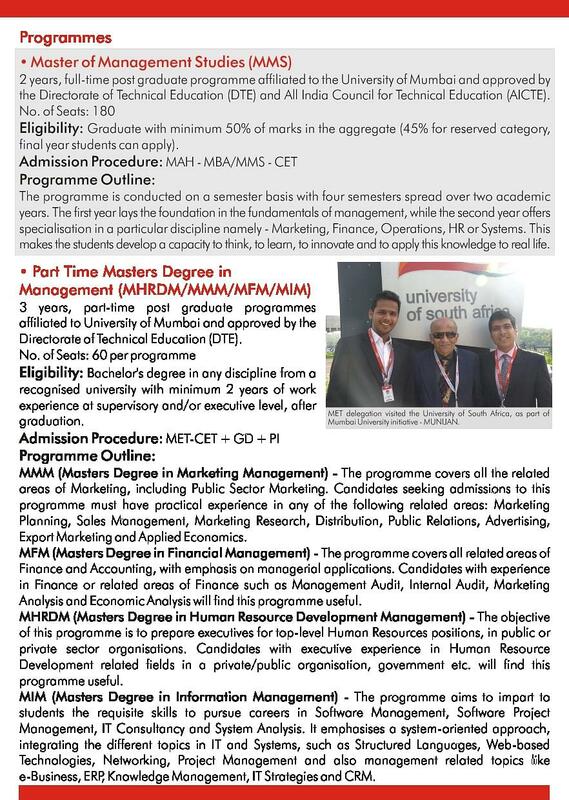 D. Program in Management Eligibility- The candidate needs to have a Master’s degree in management from a recognized university. The candidate needs to have a valid score in the PET examination conducted by the university. The candidate needs to have a valid score in MAT/CMAT/MAHCET. The Placement Cell at MET Institute of Management aims to match the expectations of the company with the aspirations of the students. MET students have been placed as global managers in international companies. For the batch of 2018, 75% of the recruiters returned to MET owing to the alumni performance. Some of the top recruiters included Growfitter, Xanadu, Starcom, Capegemini, RBS, IDBI Bank, Hindustan Unilever Limited, Godrej, Morgan Stanley, Indiabulls, Trinity, HDFC Bank, Bank of America, Birla Sun Life, Deloitte, Kotak, IBM, etc. 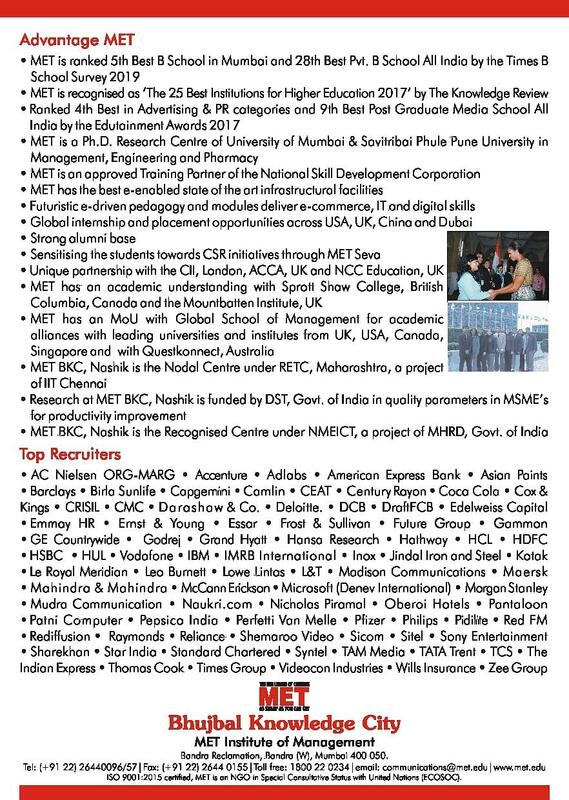 For more information on MET Institute of Management Placements, click here. We really have a great experience. Teaching and learning is practical oriented, that's the best part. They support and encourage us. We learn, we enjoy. Everything is good you enjoy your college days here. But at the same time you need to be also active in your studies as the open culture also leads to poor marks in your exams.You can make out the level of alumni network. Its world wide in very field we know. You will find most of the CEO level employees. MET IOM has constituted a Women Committee to discuss and deliberate upon issues related to dignity, safety, prevention of sexual harassment of women at work place and overall development of female employees. It is a broad based body headed by chairman of the institute and a female Faculty of the Group and has more than fifty percent female members. The alumni network of MET IOM is very resourceful, rich and helpful and same can be said for the MMS department. The alumni network is very much strong, those who got passed out of here wish to be contacted. Those who are in contact do offer help for student. There is a good support of senior students in all type of college activity and study. They give reference to other institute for college and give knowledge about subject or faculty. 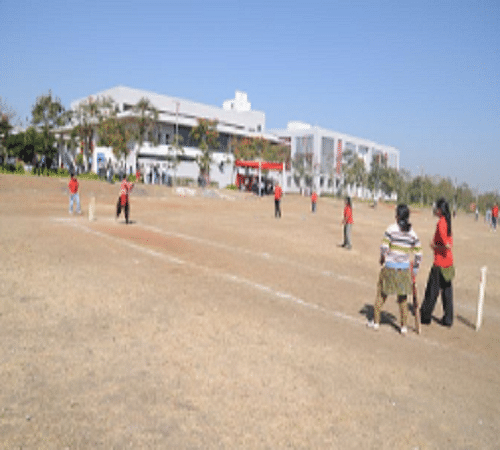 This is one of the best schools in India in terms of ROI and campus infrastructure. There are quotas for sc, st and obc students. A general category student requires around 70 percentile to get into MET IOM. The admission process consists of group discussion and interview. I did not give any entrance exam. I got chance in this college on the basis of merit. I chose this course as I wanted to go in this field.and i opted for this course because of its placement opportunity and infrastructure.this college is best for every student. There is no any entrance examination for this college. That give admission based on merit basis i like the way they teach there students which is the main point which every student got in mind plus the have a very good placement they have recruiters all over India .